CeramicSpeed Pulley Wheels suitable for all Campagnolo 11 speed groupsets. CeramicSpeed Pulley Wheels reduce friction compared to the original equipment. between the power transferred from your legs and the rear wheel. Each pulley wheel is fitted with CeramicSpeed high quality bearings to create a more efficient drivetrain. CeramicSpeed bearings have been appearing all over the place in recent years, gracing the hubs and bottom brackets of many of the premium brands. Longer life and reduced friction (lower drag) are the key benefits of ceramic bearings. They're super-strong and super-smooth, and resistant to corrosion and wear, so they stay that way. 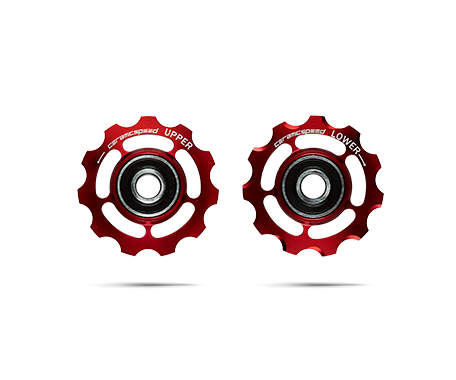 Pulley wheels (or jockey wheels to some) have long been the place for those pursuing "marginal gains" to save a few grams and maybe add a little bling... CeramicSpeed have developed these to be both efficient, lightweight and rather attractive. Constructed from aluminium alloy and carefully sculpted for lightness and strength, the standard pulley wheels are available in black or red anodised finish. Or for the ultimate strength to weight ratio and resistance to wear and tear, go for the Titanium option. Particularly for gravel/adventure/cross bikes, or if you simply ride a lot in wet weather, the Ti pulley wheels are extra hard wearing. This Ti option is also available with either standard or coated bearings - the coated option provides even greater friction reduction and will last longer still. 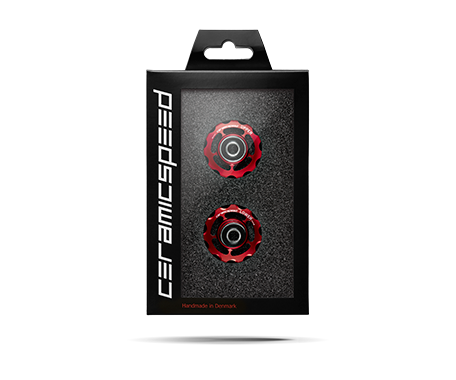 CeramicSpeed make the point that the pulley wheels are the fastest spinning bearings on your bike, so the extra smoothness and reduced friction here won't just help with shifting gears, it'll help to get you shifting at a higher speed too.